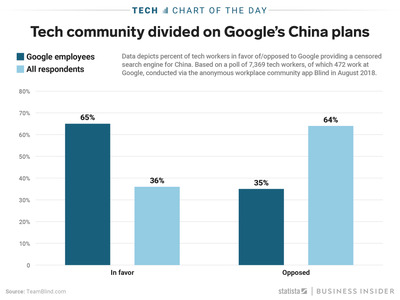 Eight years after Google pulled its search engine from China due to concerns over censorship and cyber attacks, the company is considering relaunching a censored search function there – and members of the broader tech community aren’t happy about it. But they’re outnumbered by Google employees. As this chart from Statista shows, 65% of the 472 polled are in favour of the company’s reversed position. There’s a clear division of opinions amongst tech workers as China’s existing human rights issues leave some sceptical that Google’s accommodation of Chinese censorship rules is a good idea.